All 33 of Burnley's claret and blue shirts over the past 100 years went on display and here we show numbers 31 to 33 that were worn by the team from 2007 to 2010. A new sponsor and a more traditional look greeted the 2007/08 season. This was a mainly claret shirt with some gold piping and a new look badge commemorating the 125th anniversary in the club's 126th year, 26 years after we'd celebrated the centenary in the 1981/82 season. 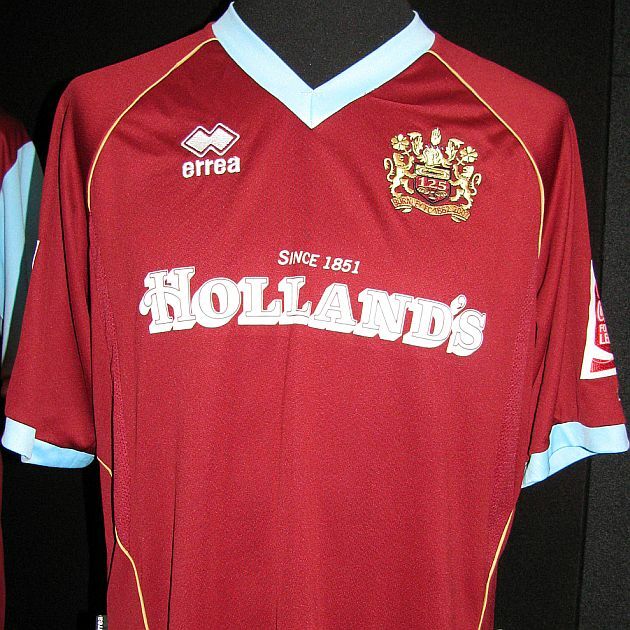 The new sponsor was Holland's, the pie firm from Baxenden. The club resisted any plans to have a pie design on the front of the shirt and this sponsorship was infinitely better in design than that of the previous sponsors Hunters. Although we didn't get the opportunity to wear the shirt at Wembley, the 2008/09 season shirt was the promotion shirt as Burnley Football Club returned to the top flight of English football for the first time since 1976. 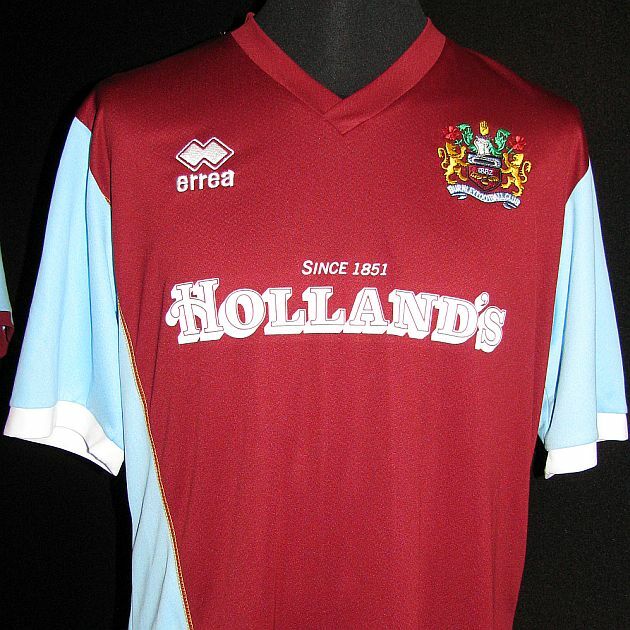 A claret shirt with blue sleeves, and with a blue panel down the right hand side, it again carried the name of Holland's which also featured on the back of the shirt. Without doubt my favourite shirt in years. Designed as a tribute to our league championship winning team of 50 years earlier, this and the away shirt were modern day replicas of those 1959/60 kits. The home shirt was the traditional claret with blue sleeves and was worn with plain white shorts along with claret and blue hooped socks for the first time since 1965. 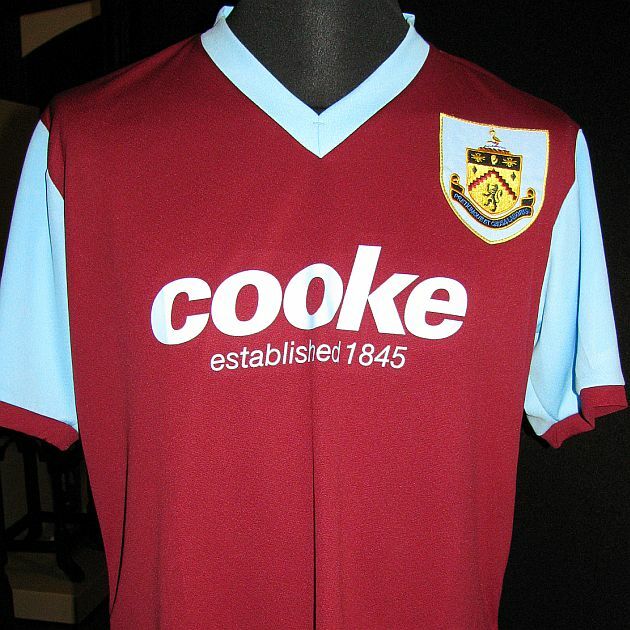 The shirt also carried the old County Borough of Burnley Coat of Arms, last worn on the club's home shirt in the 1968/69 season. The club signed a new and third deal with Errea, but this was for one year only. It proved to be their last as kit manufacturers whilst there was a new local company advertising on the shirt in Cooke, the oil company based in Padiham.